Data from meteorites and NASA’s Spirit rover has revealed new information about the chemical composition and evolution of Mars, suggesting that Mars had an oxygen-rich atmosphere 4 billion years ago. Differences between Martian meteorites and rocks examined by a NASA rover can be explained if Mars had an oxygen-rich atmosphere 4 billion years ago – well before the rise of atmospheric oxygen on Earth 2.5 billion years ago. Scientists from Oxford University investigated the compositions of Martian meteorites found on Earth and data from NASA’s ‘Spirit’ rover that examined surface rocks in the Gusev crater on Mars. The fact that the surface rocks are five times richer in nickel than the meteorites was puzzling and had cast doubt on whether the meteorites are typical volcanic products of the red planet. 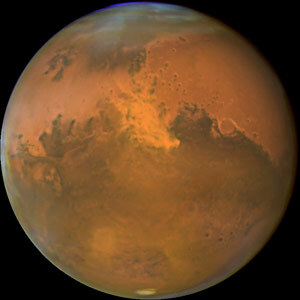 ‘What we have shown is that both meteorites and surface volcanic rocks are consistent with similar origins in the deep interior of Mars but that the surface rocks come from a more oxygen-rich environment, probably caused by recycling of oxygen-rich materials into the interior,’ said Professor Bernard Wood, of Oxford University’s Department of Earth Sciences, who led the research reported in this week’s Nature. Whilst it is possible that the geological composition of Mars varies immensely from region to region the researchers believe that it is more likely that the differences arise through a process known as subduction – in which material is recycled into the interior. They suggest that the Martian surface was oxidized very early in the history of the planet and that, through subduction, this oxygen-rich material was drawn into the shallow interior and recycled back to the surface during eruptions 4 billion years ago. The meteorites, by contrast, are much younger volcanic rocks that emerged from deeper within the planet and so were less influenced by this process. A report of the research, entitled ‘Volcanism on Mars controlled by early oxidation of the upper mantle’, is published in this week’s Nature. The research was carried out by James Tuff, Dr Jon Wade, and Professor Bernard Wood at Oxford University’s Department of Earth Sciences and was supported by the Science and Technology Facilities Council (STFC) and the European Research Council. 6 Comments on "Data Suggests Mars Had An Oxygen-Rich Atmosphere"
Are you trying to say 4 Billion years ago, or is this a type and was intended to read 400 millions years ago? My question connects to Algernon’s comment. My limited understanding of atmospheric oxygen on Earth is that it is produced as a respiration byproduct from photosynthesizing plants. When those plants emerged on Earth, the increasing levels of oxygen led to the creation of banded iron layers found around the planet from oxidation, as well as creating radically colder climate (“snowball Earth”). I’ve also heard that atmospheric oxygen is continuously replenished by living plants; without those plants, the oxygen would quickly (on a geological time scale) disappear. So the implication is that some kind of plant life existed on Mars. Am I far off? Is this a possibility? What are other mechanisms for atmospheric oxygen? Just asking. All the SETI scientists have said that finding an exoplanet with an oxygen rich atmosphere is almost proof of plant life. So I’m confused as to why these scientists are saying it might have been produced by a non-biological chemical rxn in the atmosphere. Wow – we might have come darn close to a superintelligence a billion years ahead of us right on the next planet over! I believe that we came from Mars just before we killed it. We dropped a few “threes” (20 ton basketballs) on Earth to eliminate the dinosaurs. Then we landed here. Hence, knowledge of the universe, and the circulatory system of the body came with us.